Everyone seems to have been bitten by the co-ord frenzy that has happened this year and this is one bug that I am glad to have caught as it has introduced something truly spectacular into my wardrobe! 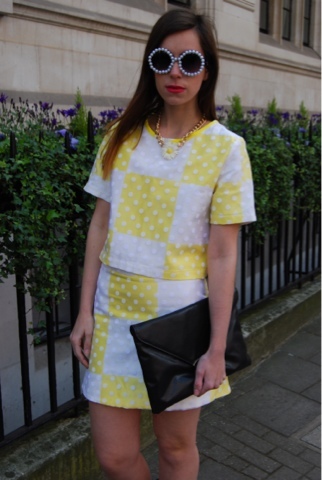 Co-ords are everywhere and are such an easy way to look on trend and slick. Although something so easy needs to be approached with care there is nothing worse than an ill fitted printed trouser suit or Bralet and skirt not suited to your figure. Like with everything this is a look that you can get really wrong but if approached carefully.. so god dam right! If your after a trouser and jacket combo, shots and top, Bralet and skirt there is such a huge variety out there with what seems like the majority of Topshop now comes with something matching you will be bound to find one that's right for you. I always like to add a bit of me when wearing a co-ord and never like wearing something as it comes of the hanger- layer them with shirts, add accessories such as necklaces, socks or a hat or add a clashing jacket. Always think about finishing of the look in head to toe dressing and never look like you have rolled out of a store without really thinking about it. This is a mistake a lot of people make and it's making those personal decisions to add your stamp that makes you stand above the rest! The great thing about a co-ord is it can offer you endless amounts of outfits if worn together but also separately with other items. 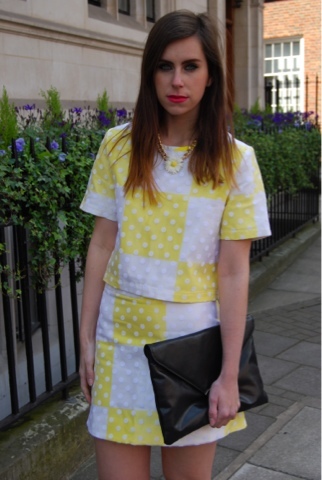 For me it's all about the printed top and skirt or short combos like Amy's leaf one and the one I'm sporting which is very similar to the Louis Vuitton yellow checkerboard print but of course with a Topshop twist- little white polka Dots.... So cute! Something that has caught my eye recently soft trouser and blazer suits in stunning colours like cobalt blue are perfect in a light silky material for the brighter weather, especially if like me you don't like showing of your legs! For this look I wore my brand spanking new co-ord influenced by Louis Vuitton I knew it wasn't long before the checkerboard print filtered down to the high street! I love this yellow colour it's great for the warmer weather and for making me feel summery. 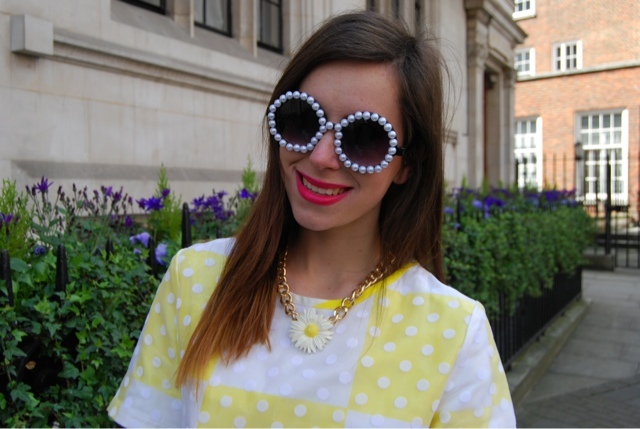 I wore my new pearl sunglasses, black clutch and polka dot socks with a barely there sandal to finish of the look. I also wore my new favourite necklace the big daisy and gold chain which is super cute and super on trend with the recent daisy hype. Adding the little details make the look stand out and be different. If I give you guys any advice this summer then this is it! Inject some double loving into your wardrobe and invest in a two piece whatever your shape or style there is one for you! Awesome outfit, LOVE the heels! Love this two piece, reminds me of LV. Super cute! I've literally just published a post with this purchase and another co-ord, can't wait to get the palm leaf print one also!